A few quick notes--when they first made it and screened for the execs they were for sure they had a failure on their hands. The success of the show was really a surprise and in some ways continues to be a surprise? It is a rather slow moving cartoon, lacking in the flash of most current animation. And of course what I love most about Charlie Brown was captured in this quote by Garry Trudeau "Schulz's message was filled with a uniquely American sense of optimism--Li'l folks with big dreams, never giving up, always trudging out to the mound one more time. But the pain of sustaining that hope showed everywhere." But the show surprised everyone by becoming a big hit and not only was it beloved then but it's still beloved now. And of course they had some reservations about the religious content but it was true to who Schulz was and they kept it and it's one of the reasons I love the special. Also! How can you not love the music that has become such an important part of our Christmases? Despite the lack of flash the program is still loved by children. It sort of reminds me of the differences I feel when watching Studio Ghibli vs. American animated movies. Studio Ghibli movies always feel like they are first and foremost for children (i.e. Ponyo) This doesn't mean they are simple or silly, but rather you can feel how much the concerns of children are front and center...it isn't doubling with racy jokes to keep the adults entertained...there's a sweetness to them I can't quite describe...and that's sort of how I feel about Charlie Brown. There is depth, but also it's a world for children. And I think kids recognize that even if it sometimes surprises us when they love these things...they don't necessarily need the flash and speed of the more popular animated movies. Anyway! The book has great portraits of the people involved in making the special and lovely pictures of the old ads along with an illustrated script. 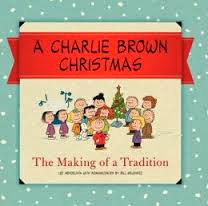 Anyone who loves A Charlie Brown Christmas and has collected the ornaments from Hallmark and such over the years will love this book. Great gift idea or great for yourself! I did receive a review copy from Harper Collins.